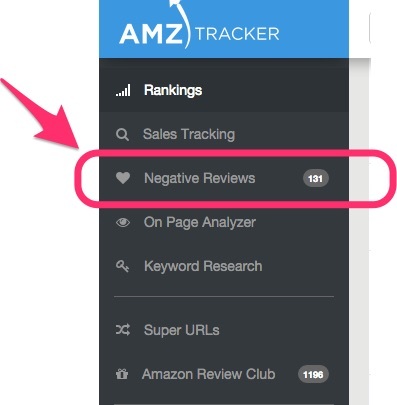 You can get notified with AMZ Tracker's Negative Reviews monitoring. Our Negative Reviews guide is here! Go to the 'Rankings' tab. Click on the 'Heart' icon for the product. Click on 'Negative Reviews' from the left menu to access your reviews. Filter the reviews to see only those products you've tagged. Click on the "person" icon to see the reviewers profile. Click on the "poppet" icon to see the review in Amazon. The AMZ Tracker system checks your listings once per day to see if there are any new bad reviews. 'Most sellers will eventually receive some negative feedback. When you receive negative feedback, put it in perspective. A 0-2% negative feedback rate is great. If your negative feedback rate is greater than 5%, you may want to review your business practices and adjust to the demands of your customers. Learn from it and let it go: Each negative feedback is a great opportunity to learn about and improve your operational practices. When you are signed in and viewing your Profile page, you will see the buyer's name and the associated order number. In many cases, it's best to look at the order which received the negative feedback, fix any underlying problems in your business, and let your good record stand for itself. Ask the buyer to remove the feedback: If you want to respond to negative feedback, the best option is to work with the buyer to improve the situation that led to the negative feedback. Then, ask the buyer to remove the feedback. To do this, contact the buyer with concern over the problem, and remedy it if possible. If you develop a positive relationship, ask the buyer to remove the feedback (if you think it's completely unbiased) Remember that Amazon's TOS actually state you shouldn't ask buyers to remove negative feedback. Instructions can be found on our buyer Help page, Remove Third-Party Seller Feedback. When contacting a buyer, always keep in mind that pressuring a buyer is unacceptable and a violation of our policies. You many want to remove negative reviews from the tool after you've seen them as to free up more capacity to show extra bad reviews due to limitations on your plan. Note: Maybe look at the older ones here that you haven't been able to change.